Kureelpa Provisional School opened on 24 February 1914, becoming Kureelpa State School on 1 June 1916. The school closed on 1 December 1990. ^ a b "Kureelpa - locality in Sunshine Coast Region (entry 48715)". Queensland Place Names. Queensland Government. Retrieved 6 August 2017. "Kureelpa". 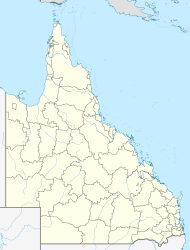 Queensland Places. Centre for the Government of Queensland, University of Queensland.